That’s all good and fine. 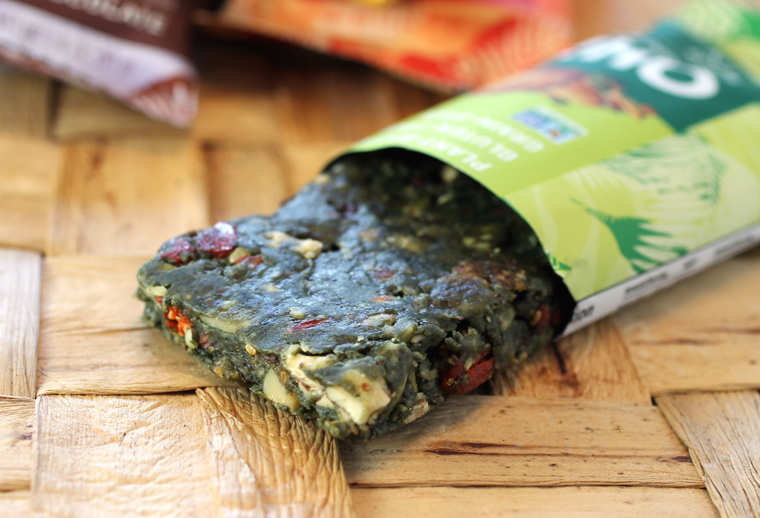 But I admit that when it comes to energy bars, I’m a gal who favors crunch. I like my bars to have good, varied texture so that you feel like you’re really sinking your teeth into something substantial. I also think that helps satiate your appetite and keep you feeling full longer. These bars have those qualities. I found them surprisingly filling. And boy, do they have crunch, owing to all the nuts (especially almonds), cocoa nibs, and seeds (pumpkin, hemp, chia, and flax) piled into them. They come in five flavors: Coconut Macadamia, Almond Crunch, Double Chocolate, Super Green, and the newest one, Peanut Butter Mesquite. One bar has 260 to 290, depending upon the variety, with 7 grams or more of protein, 15 grams or more of total carbs, and 19 grams or more of total fat. The Coconut Macadamia is quite rich with coconut and crunchy macadamias. The Almond Crunch is packed with almonds. So much so that it’s like a brick wall of nuts with cocoa butter mortar holding it all together with nice little lick of saltiness from Himalayan salt. The Double Chocolate features unsweetened chocolate so you get to enjoy the deep dark bitter edge of cocoa without veering into dessert territory. The Peanut Butter Mesquite is again packed to the gills with peanuts. The mesquite gives it a smoky savoriness so it is almost reminiscent of chicken satay sauce. It’s not called Super Green for nothing. The real surprise is the Super Green. It looks like something the Swamp Creature would gnaw on. It’s the hue of green seaweed, owing to organic spirulina and organic chlorella. Organic mulberries and goji berries give it a natural tasting sweetness that compliments the slight vegetative quality of this bar. I can’t believe how much I liked this one. It not only tastes good, but makes you feel as if you’re really eating something good for you. Made without preservatives, the bars can be left at room temperature for about a week, but for longer storage, they need to be refrigerated. That’s the only drawback if you’re used to just tucking energy bars in your purse or desk drawer for weeks at a time. 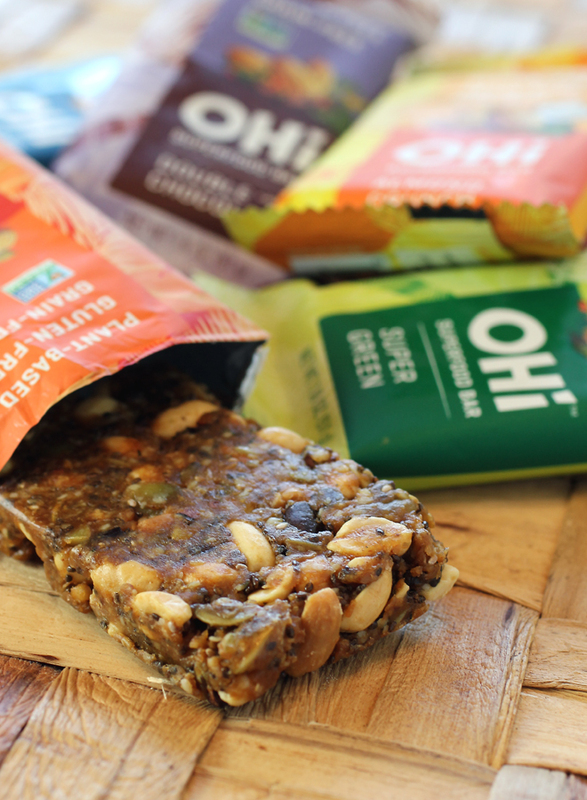 The 1.8-ounce bars are available on the OHi site for $3.99 each or in packs of eight for $24.99. 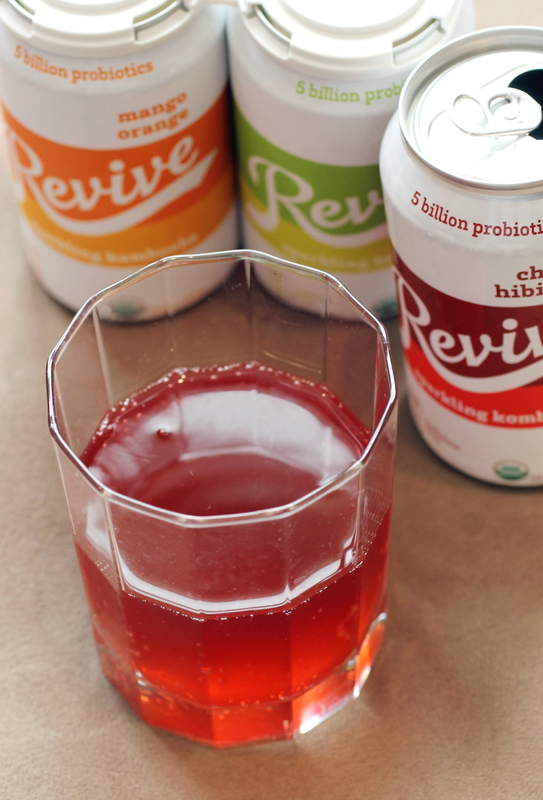 Find them also in the refrigerator section at Whole Foods, Safeway, Mollie Stone’s and soon at Sprouts. Kure Juice Bar, one of Portland, Ore.’s first plant-based cafes, is known for its acai bowls, fresh juice and meal shakes. 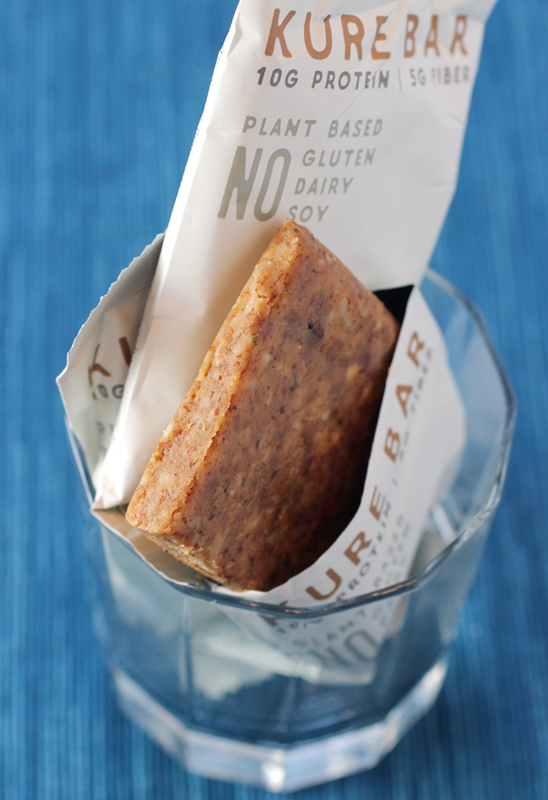 Now, it’s debuted its new plant-based Kure Bar that has no gluten, dairy or soy. Its first flavor, Almond Butter & Sea Salt, is made with plenty of almond butter, oats, protein powder, cocoa nibs, flax seeds, hemp seeds, chia seeds, and maple syrup. The texture is dense, and more pasty owing to the predominance of almond butter, which adds nice richness and nutty flavor. Each bar has 270 calories, 18 grams of fat, 20 grams of carbs, and 10 grams protein. A six-pack of bars is available for $21 on the Kure Bar site. Normally, I try to steer clear of too many snack products. (I know that’s hard to believe!) But I admit I do make an exception for Triscuits. I’ve loved their shredded wheat-like texture since I was a kid. And if there’s a box around, I will make a beeline for it. Now, Triscuit has just launched its first non-cracker product in its 100-year-plus history: Triscuit Wheatberry Clusters. Whole kernels of wheat berries are combined with fruits and nuts for a very crunchy snack that’s a little like granola if it were made with crisp puffed wheat. These clusters are made without artificial flavors or flavors. They come in three varieties: Cranberries & Cashews, Cherries & Almonds, and Pumpkin Seeds & Sweet Corn. 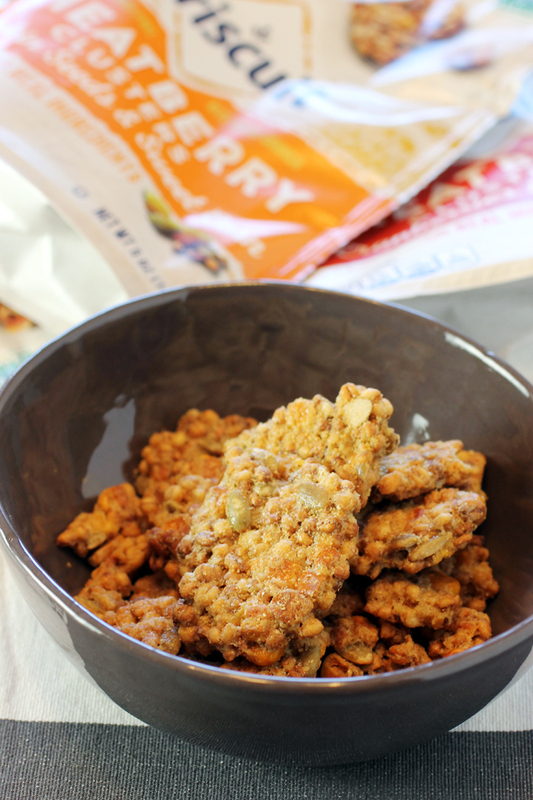 Triscuit Wheatberry Clusters in Pumpkin & Sweet Corn flavor. They’re pretty addictive, what with the crunch factor, sweetness of dried fruit along with their chewy texture, and just a bit of salt to balance everything out. The Pumpkin Seeds & Sweet Corn one even has a slight nostalgic corn nut-like flavor, though without the break-a-tooth hardness. A 1-ounce serving has 130 calories, with 0 cholesterol, 5 grams of total fat, 19 to 20 grams of carbohydrates depending upon the flavor, and 170 to 180 grams of sodium. Enjoy out of hand when you have the munchies. Or top yogurt with it. Or even a salad. A resealable 5-ounce bag is $3.49 at Target.